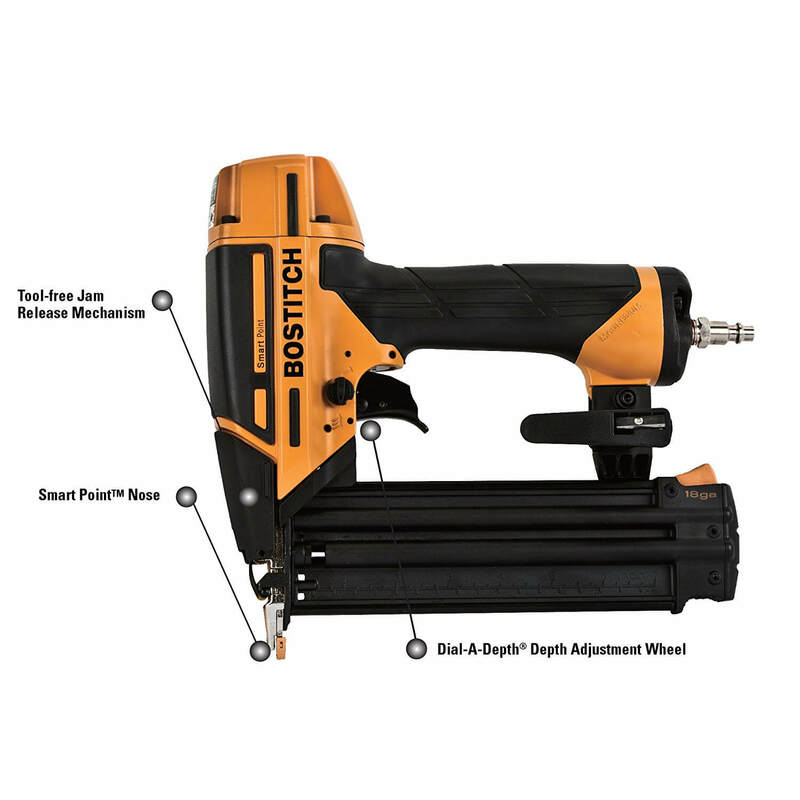 Super efficient and durable Bostitch BTFP12233 Smart Point® 18 Gauge Nailer Kit is perfect for cabinetry, upholstery and paneling with options from trigger system and countersinking to meet your project needs best. We gathered in-depth information on BOSTITCH BTFP12233 Smart Point® 18GA Brad Nailer Kit and its feature to help in your quest to find the best brad nailer for you. Find out more about its feature in the following sections. Smart Point® technology is used for easy nail placement as a result of a smaller nose compared to other brad nailers, and the contact trip doesn’t require compressing to actuate the tool. This Smart Point® nailer drives 18 GA brad nails from 5/8″ to 2-1/8″ length and the risk of oil stains is minimal because of oil-free operation. It’s easy, and quick jam cleaning mechanism facilitates nail removal without the help of any additional tools. Dial-A-Depth™ control feature ensures precise countersinking of brad nails, along with a changeable trigger system for sequential or contact operation. This Smart Point® 18 gauge brad nailer kit also features 1/4″ air fitting, rear air exhaust, & belt hook with an integrated pencil sharpener and the kit Includes nailer, 1/4″ Air Fitting, sample brad nails, carrying case and extra No-Mar tips. Max. Fastener Length: 2 1/8 in. 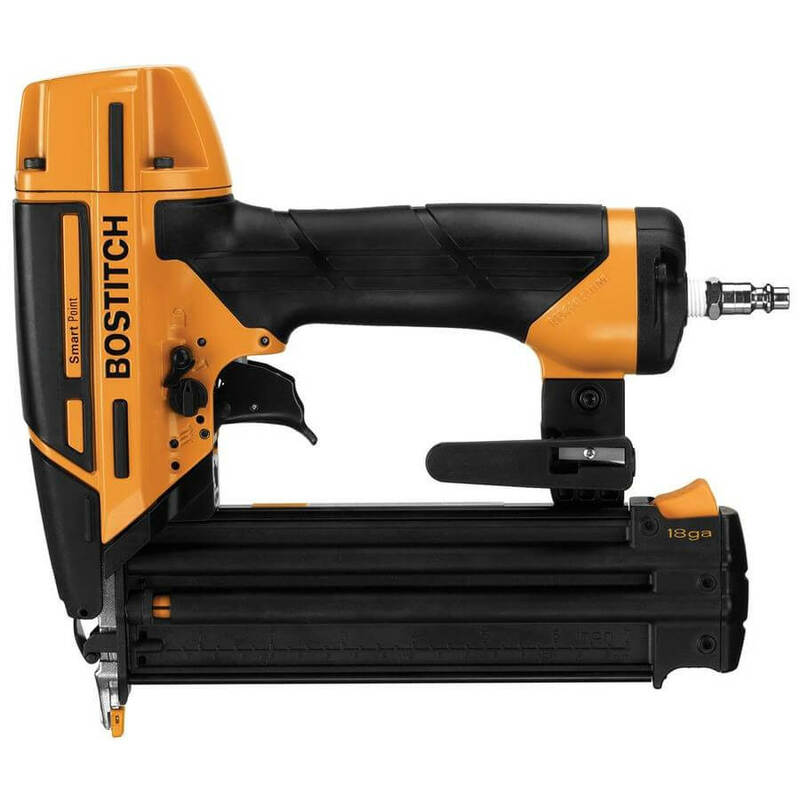 We are certainly excited about the fact that BOSTITCH BTFP12233 feature Bostitch own designed Smart Point Technology enabled nose piece 80% smaller compare to available brad nailer in the market. A user gets two-fold benefit from this unique feature. It makes easier to see where your fastener will penetrate the work surface with the help of very fine probing tip and shoot a nail in a tight spot with ease. 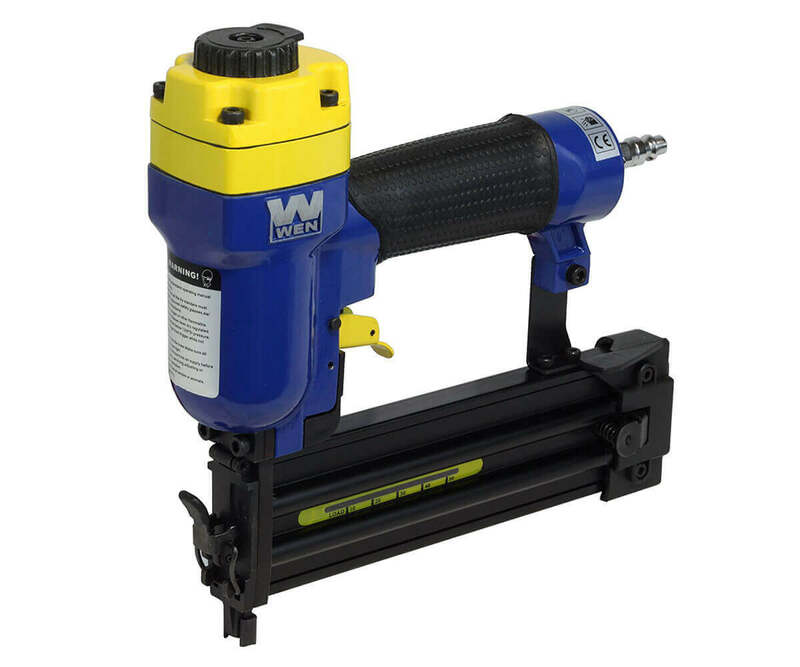 And don’t forget we are talking about brad nailer that is used for finished carpentry, in that case, BTFP12233 tiny workpiece reduces the chance of damaging work surface by targeting smaller surface area. Oil free operation of the tool is another area where BOSTITCH BTFP12233 can put the rest of the competition to shame. Most of the air powered tool require regular oiling to keep them fully functional. Some pneumatic brad model may require less oiling but only BTFP12233 is the oil free opeation tool now on the market. It means you do not need to fear about leaking and oil stain, moreover less time spend on maintenance and re-oiling the tool. Dial-A-Depth™ control feature ensures precise countersinking. When choosing a brad nailer, make sure to have Adjustable depth of drive. You can select the depth of nails driving using this feature. The dial-a-depth control switch located at the front of the trigger. You can easily drive the nails to your expected depth adjusting this dial. It looks more professional when a perfect nail drives to a workpiece. BOSTITCH BTFP12233 magazine can load up to 100 nails (18 gauge brad nails) from the nail size 5/8 inches to 2-1/8 inches. Having more option for nail range increase the area where you can use your brad. It saves the reloading time and can work for a long time. The magazine is a stick magazine which attached with the nailer straightly and designed to load nails from the side. It is fascinating to see Bostitch added a selectable trigger for the BTFP12233. Typically, brad nailers are used for precise nailing and the sequential fire should be more than fast enough if you know how to use the tool. By adding a contact trigger for bump firing Bostitch improved BTFP12233 usability and applying brad fastener with greater speed where precision placement is not important. The firing mode changing option located above the trigger. There is also trigger lock switch, and you have to lock the trigger before changing the firing mode. You will be looking for a tool-free jam release mechanism when you don’t want to use another tool like Allen wrench to remove nail jam. BOSTITCH BTFP12233 have this nice feature, a tool less fast and easy jam release option located on the front of the nailer. The ultra-quiet rear air exhaust with muffler keeps air away from you and your workpiece. Also, a pencil sharpener integrated with reversible belt hook to sharpen your pencil if needed. The no-mar tip is another nice feature of this nailer to protect your work surface. You can remove the no-mar tip easily if you don’t need it and can store it in the tool as there is built-in storage to keep it safe. 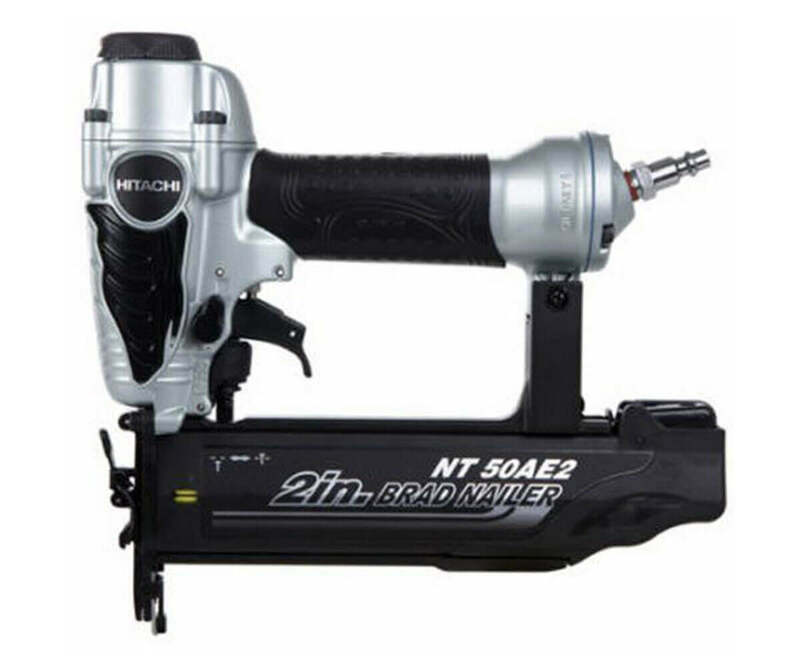 BOSTITCH BTFP12233 is a pneumatic powered brad nailer. 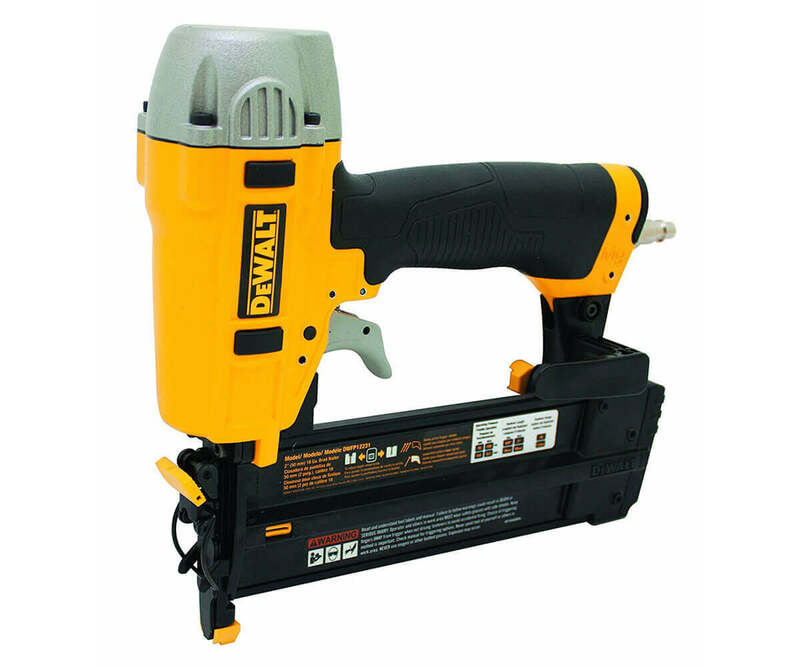 This nailer requires operating pressure 70-120 PSI to drive the nails perfectly. So, you need an air compressor to supply the required compressed air to the nailer. A small or medium-size air compressor can easily generate the required power. 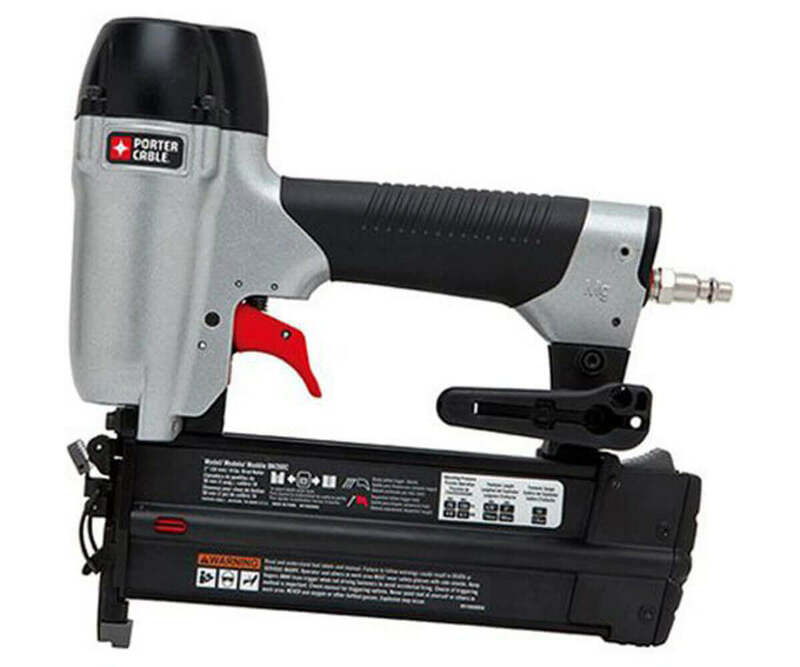 This nailer can perform well for use in interior trim, cabinetry, upholstery, doors and windows casing, kitchen crown molding, baseboards etc. Also, the Smart Point Technology increases the tool performance in tight spaces and reduces the workpiece damages. Lightweight magnesium design for added durability. Oil-free operation, No regular maintenance required and eliminates the oil stain risk. Selectable trigger system allows the sequential to contact operation converts easy. Trigger locking feature allows to keep you safe when the tool not in use. Swivel air fitting for maneuverability. Reversible belt hook integrated sharpener eliminates carrying a sharpener. Low nail lockout prevents dry firing. Carry case included with this tool includes 1/4 inches air fitting, sample brad nails, Hex wrench and belt hook. Straight magazine design is difficult to use in tight spaces. Nail jams will often happen. To check how many nails are left, you need to open the magazine. Bostitch BTFP12233 is the culmination of integrated feature mixed with well-thought design to provide maximum user benefit and accurate brad nail placement resulting from the use of Smart Point Technology. A perfect nailer for trimming work comes with numbers of excellent features. It also outdone most mid and high-end model in terms of features available at higher prices. We found every feature added to this tool are precisely put together for best brad nailing experience. Beside Smart Point tip line of sight, swivel connector and low nail indicator with dry fire lockout will definitely wow you.